Twisted Insurrection is a Total Conversion modification for Tiberian Sun which will run standalone. Twisted Insurrection places you in an alternate setting where Nod were victorious in the first Tiberian War rather than GDI. 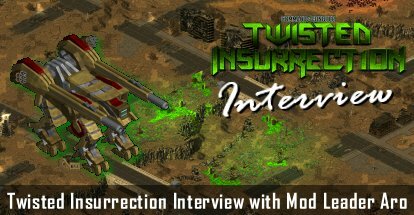 Dbjs2009 recently had this quick interview with Aro, the mod leader and designer for Twisted Insurrection. Please tell us something about yourself? I am Aro, I’m 18 years old, I live in England, I work as a Bartender to earn my income and I love going out for a drink (or a mash-up) with my buds and I love to Mod. Please tell us something about your mod? There are a lot of things to tell about Twisted Insurrection, I will cover the overview: Twisted Insurrection is a total-conversion mod changing everything from units to terrain to structures to storylines. Twisted Insurrection is like an alternate Tiberian Sun where Nod were victorious in the first Tiberium war rather than GDI causing major changes to the Tiberium World, in order to have any hope in returning the world to a healthy state, multiple new organizations have risen to power such as GloboTech and Civilian Militia teams. With Nod being the largest and most powerful force on Earth in Twisted Insurrection, GDI will need every grain of help they can get. What makes your mod so special and popular like this? It’s a matter of opinion I suppose for what makes Twisted Insurrection special. I personally think that the storyline, new terrain graphics, our single-player and multi-player game-play, the new campaigns and the general new design of the Nod faction we have in the works are a few of the main things that make Twisted Insurrection special. As for popularity, I like to think that all of the Public Relations work that I have done helped us out there. It really is a warm feeling knowing that so many people are looking forward to the product of your years of hard work. At the moment I only have one goal for Twisted Insurrection: To be released and successful as soon as possible. I have good plans for the up-coming beta release and will definitely continue work on this mod until it is complete. There are no real future plans for Twisted Insurrection as of yet other than completing it. Once it is fully-complete, I don’t know if I will continue to work on it other than releasing additional map packs and patches. It’s too early to tell though, but I am devoted to working on this mod and I doubt I’ll be leaving it behind any time soon. How did you get the idea for to make this mod? It’s difficult to say. Twisted Insurrection never started off with the storyline it has today. Back when I first started work on a Tiberian Sun mod which later gained the name Twisted Insurrection it was just a new campaign with some additional units for Tiberian Sun: Firestorm. After a long time of development when I changed the mods direction, we came up with the Alternate Tiberian Dawn ending. I was mainly in favor of this idea because it is yet to be done, which is another one of the things that makes Twisted Insurrection unique. Have you faced any problems with your team or your mod before? There have been many bumps in the road and I can guarantee there will still be many more to come, but I always get back on the horse after falling off. Some of the problems I’ve had in the past are related to staff members leaving to pursue other roles on other projects. A long time ago a link was leaked to a Twisted Insurrection staff beta incidentally by an ex-member of the TI team. The link is no-longer available and all history of this incident occurring has been erased. The link-leaking was a large blow for Twisted Insurrection, but one and a half years later, we’re stronger than ever. The modding community is excellent. The people (most of them anyway) are great for giving feedback and helping you improve where-possible, though at the same time, there are a lot of members that do not appreciate the work put into mods like Twisted Insurrection. There is a lot of work to be done and it is impossible to please everyone pixel-by-pixel. I have had Twisted Insurrection hosted on PPMSite.com ever since day one and I have no plans to move forums at any point in the foreseeable future. The site is home to a lot of veteran modders like myself and is also home to many other impressive mods for all C&C Games. PPM is my favorite Modding website despite it’s recent increase in the number of idiots. I’m working on another mod for Yuri’s Revenge known as Evolution. I have had the plans for Evolution in the back of my mind for a long time and would finally like to get it off the ground, but as I’m leading both Twisted Insurrection and Evolution, progress will be slow on Evolution however since Twisted Insurrection is and always will be a much higher priority. Some people think that C&C 4 is the final chapter, What do you think? Yes, it has been announced that C&C 4 is the final chapter for C&C’s Tiberium Universe, but no, that does not mean it’s the end. You never know what will happen in the future. Is there is any thing you want to tell the community, C&C fans? Twisted Insurrection will never die.